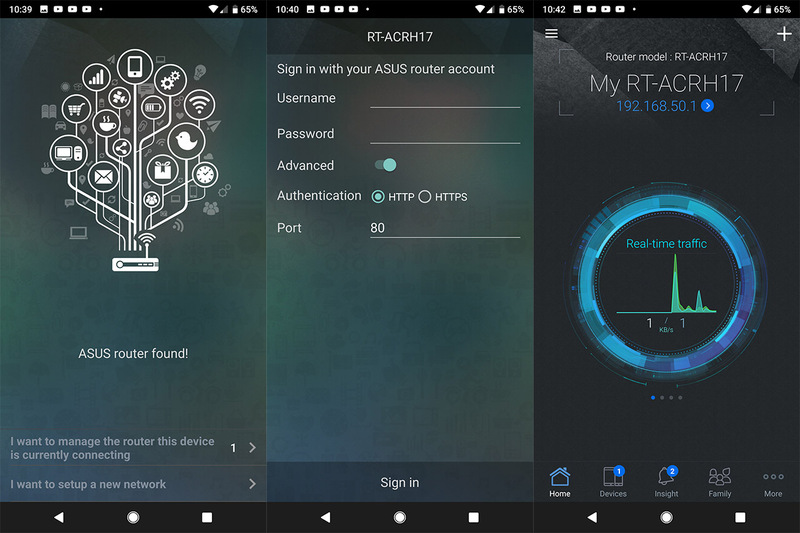 The Asus RT-ACRH17 is an AC1700 router that was released a bit over a year ago as a successor to the relatively popular RT-ACRH13 and part of the exclusive RH line, so it’s limited to only a few countries. 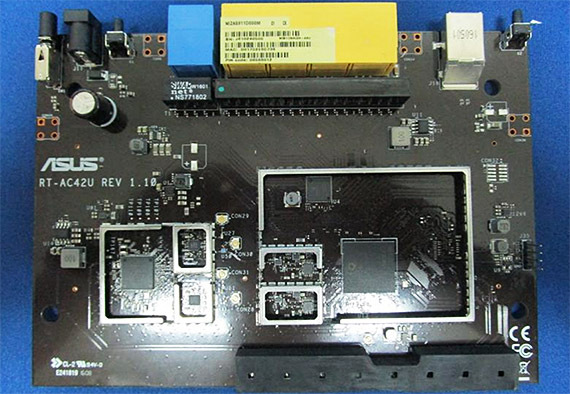 The RT-ACRH13 felt more like an experiment from ASUS to see if it could implement more demanding features in a relatively inexpensive device and the RT-ACRH17 follows suit by deciding to go full Qualcomm, whereas the manufacturer usually prefers Broadcom (this means no support for the ASUSWRT-Merlin third-party software). 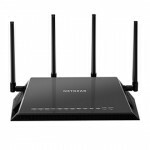 Furthermore, the ACRH17 is advertised as a dual-band tri-stream router, while the internal hardware suggests that it could have very well supported three bands and four streams (since it is equipped similarly to Zyxel Multy X and Netgear Orbi); nevertheless, similarly to its predecessor, the RT-ACRH17 is decently priced and promises to offer a wireless performance above its advertised class and a good network stability, so let’s have a closer look at this peculiar router from Asus and see how it performs against its competitors. 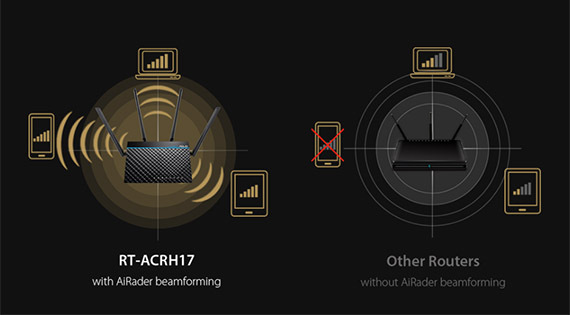 Note: Unlike the Broadcom-based AC1750 RT-AC66U B1, the RT-ACRH17 does not support AiMesh, so you won’t be able to add it to a larger mesh network. If you’re familiar with the Asus RT-ACRH13, well, the manufacturer didn’t change that much the design blueprint and the RT-ACRH17 ended up looking close to identical to its predecessor. 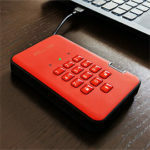 So, the case remains rectangular, which, unlike the newer RT-AC86U, can be seated horizontally, it has also kept the signature diamond shape pattern on the top (with a narrow blue band to break the monotony of the all black finish – it still retains fingerprints) and the same four antennas point upwards, two from the back and two on the lateral sides. 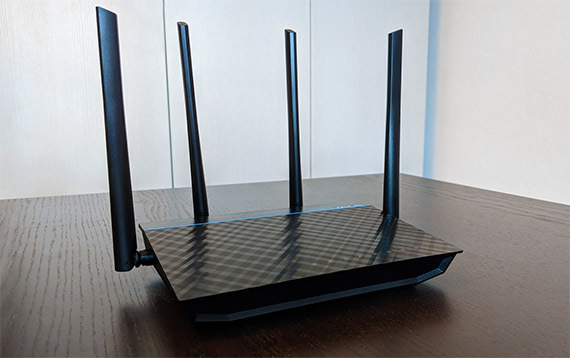 Unfortunately, the antennas come already attached to the body of the router, so they can neither be removed, nor upgraded. 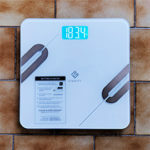 In terms of dimensions, the RT-ACRH17 measures 8.14 x 5.85 x 1.59 inches (LWH) and, besides being slightly heavier, a small increase in width is just another small difference between the current model and its predecessor (which has a width of 1.39 inches). 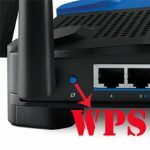 It’s clear that Asus mostly focuses on the mid to high end consumer router segment and I saw that the 802.11ax has greatly sparked its interest, but a small variance in the design of its ‘lesser’ models would have been welcomed (and no, this design is not as emblematic as the WRT line to keep pushing it forward on every new device). The plastic case felt very sturdy, so when pushing on the top, there was no flex or creaks and, when turned upside down, the bottom is almost completely covered by cut-out areas to ensure a proper airflow. The same can be said about the RT-AC68U which had some problems with the heat management, so did the RT-ACRH17 perform better? It got a bit warmer than the RT-AC86U, but overall, Asus did a great job at keeping the internal temperature in check (even when the device was put under stress). Also on the bottom area, you’ll notice four feet with silicone pads that have the role to keep the router from budging and, considering that it’s relatively lightweight (it weighs 1.12 lbs), the pads kept the device in place no matter the amount of cable that were connected. In between two of the bottom feet, there are a couple of recessed areas that allow you to mount the device on a wall (spread the antennas and you got yourself a quite ominous looking device). 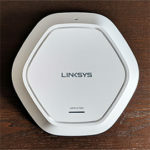 It’s obvious that the router doesn’t follow the latest minimalist trend that’s commonly found with the WiFi systems, but the traditional design does have its own advantages, such as the better heat management and multiple LEDs to accurately show the status of the device (there’s also the ability to upgrade the antennas, but that’s not the case here). That being said, the RT-ACRH17 positioned the LED indicators array on the top towards the front side: from the left, there’s the Power LED (solid blue indicates that the device is ready, while slow flashes show that the router is in Rescue mode and quick flashes indicate that the WPS is processing), the 2.4G and the 5G LEDs (flashing blue indicates that data is being received/transmitted), the WAN LED (red indicates that there is no Internet connection) and four LEDs, each showing the status of its respective LAN port. Although being almost identical to the ARCH13, Asus did move the front USB port to the back and put the two rear-positioned antennas closer to each other. The rest of the ports and buttons remained on the rear side of the router: from the left, there’s a small WPS button, the aforementioned USB 3.0 port, four Ethernet Gigabit LAN ports, one (unshielded) Gigabit WAN port, a small Reset button (press and hold it to return the device to factory default settings), the Power connector and a Power On/Off button. 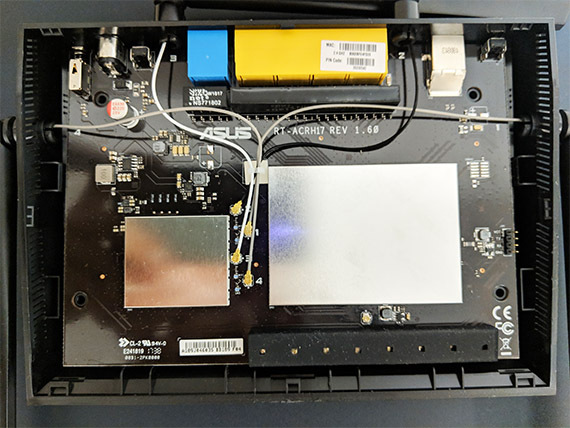 Inside the case, Asus has decided to built the router on the Qualcomm platform, so the RT-ACRH17 is equipped with a Qualcomm Atheros IPQ4019 SoC on 40nm (quad-core ARM Cortex A7 CPU clocked at 717MHz), a Qualcomm QCA8075 Ethernet Gigabit Switch chip, 128 MB MXIC L172210 MX30LF1G18AC-TI NAND Flash Memory and 256 MB of RAM (NANYA 1729 NT5CC128M16IP-DI). The ACRH17 uses the IPQ4019 SoC (along with a Richwave RTC6649EX power amplifier) for the 2.4GHz wireless band, but, while the chip supports 4×4 MU-MIMO, here, it’s limited to 2×2 and no, it’s not being divided for an additional 2×2 5GHz band (the quad-core A7 is also not really the most powerful CPU, but, considering the price point, it’s relatively decent); for the 5G band, the router uses the Qualcomm QCA9984 4×4 MU-MIMO chipset (along with the Richwave RTC6665 power amp). 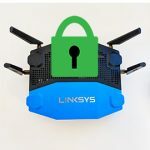 This configuration closely resembles that of the Netgear Orbi RBK50 and the Zyxel Multy X which are both tri-band systems, so it’s a bit odd that Asus decided to limit the true potential of the device in such a drastic way. I suppose the reason why the RT-ACRH17 is available only in certain regions is because Asus wasn’t sure how the audience would react to the device and wanted to keep to a minimum a possible failure? In any case, the maximum theoretical data transfer rate on the 2.4GHz radio band is 400 MBps, while the maximum theoretical data transfer rate on the 5GHz radio band is 1,300 Mbps (adding up to the advertised 1,700 Mbps). 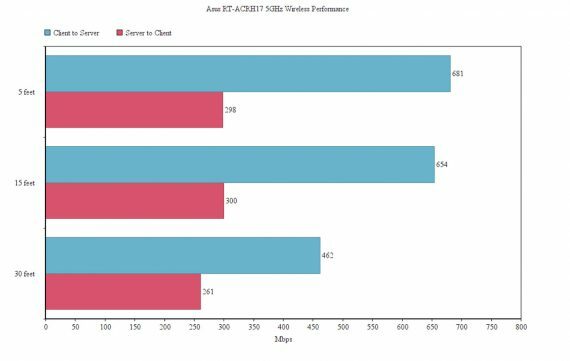 When I had a look at the RT-ACRH13 about two years ago, I noticed that Asus has implemented a couple of 802.11ac WAVE 2 features that have now become the norm with almost all new routers – yes, even the cheaper ones) and it seems that the Asus RT-ACRH17 comes with a similar package of features, while purposely steering clear of the AiMesh technology. 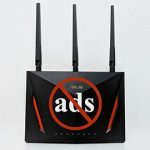 This is a bit of a let down since lots of Asus routers support it, even older ones, such as the RT-AC68U (I’ve tested it alongside the RT-AC86U using AiMesh) and one of its direct competitors, the RT-AC66U B1 – this means that the router can be used only as a stand-alone and you won’t be able to create a mesh network with multiple Asus ACRH17 devices (at the same time, only the powerful tri-band routers will truly be able to deliver a proper wireless performance and the reason is the backhaul traffic handling). 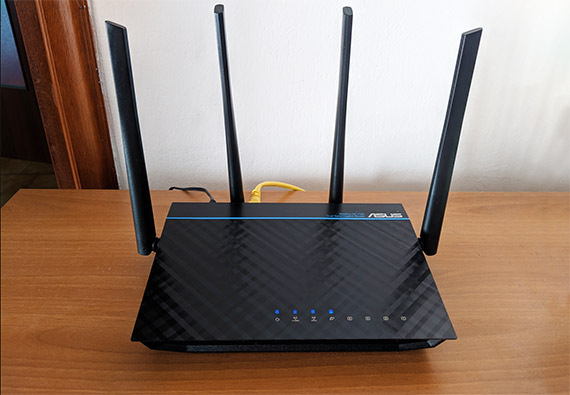 The router does take advantage of the AiRadar TX Beamforming, which means that it focuses and optimizes the signal towards the wireless connected clients (using its proprietary RF fine tuning), so it can extend the signal coverage and, as the manufacturer claims, it can also enhance the stability of the network. 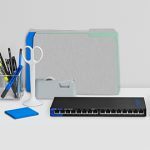 Furthermore, the router supports MU-MIMO, so multiple clients can be served at the same time, without having to compete for the bandwidth (supports the connection of up to three compatible devices). 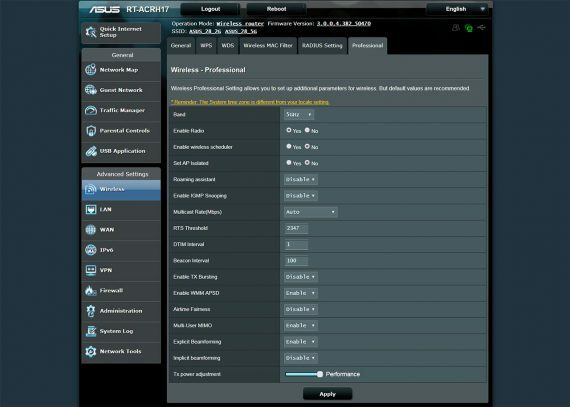 To test the Asus RT-ACRH17, I took two computers, one is a Desktop PC equipped with the Asus PCE-AC88 WiFi card (it will act as the client) and the other is a relatively powerful laptop that will act as the server. On the first step, I connected both computers to the router using CAT6 cables and tested the LAN to LAN throughput (TCP): from the client to the server, I got an average of 897 MBps and from the server to the client, an average of 839 Mbps. 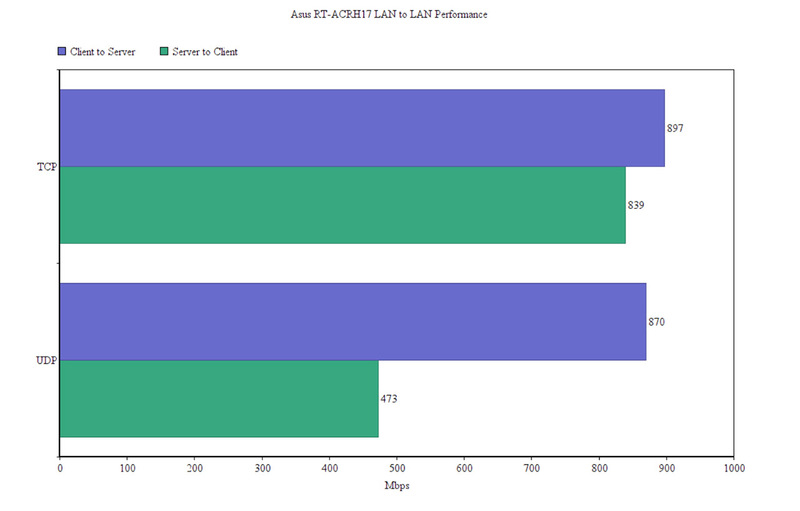 Next, I tested the LAN to LAN throughput (UDP): from the client to the server I got an average of 870 Mbps and from the server to the client, an average of 473 Mbps. Afterwards, I connected the Desktop PC to the 5GHz network and, from the client to the server, at 5 feet, I measured an average of 681 Mbps, while at 15 feet, the speed remained relatively constant at an average of 654 Mbps and, at 30 feet, the speed went down to 462 Mbps. So far, the router performs a lot better than the Netgear Orbi (despite sharing similar internal hardware), so let’s see the server to client wireless throughput: at 5 feet, I managed to measure an average of 298 Mbps and at 15 feet, I measured an average of 300 Mbps; at 30 feet, the speed remained surprisingly constant at an average of 261 Mbps. On the next step, I switched to the 2.4GHz network and, from the client to the server, at 5 feet, I measured an average of 160 Mbps, while at 15 feet, the speed went down to 143 Mbps and, at 30 feet, I measured an average of 105 Mbps. From the server to the client, at 5 feet, the router delivered an average of 94.7 Mbps and, at 15 feet, I measured an average of 110 Mbps; at 30 feet, the speed went down to 108 Mbps. Lastly, since the router comes with a USB 3.0 port, I decided to test its storage performance using a powerful SSD drive (Samsung T5): I wrote a 2.5GB multimedia folder at an average of 27 MBps, while the reading speed averaged at 37.9 MBps. 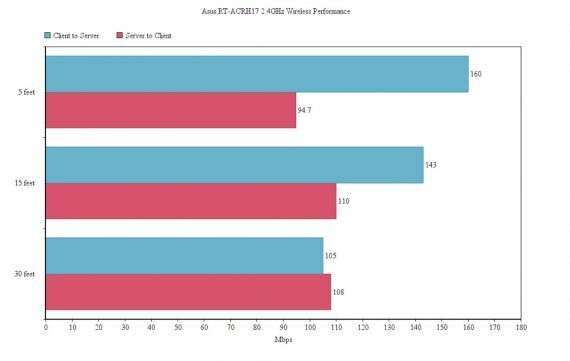 Unfortunately, the storage performance is a bit below average and significantly lower than what the RT-AC86U could deliver. 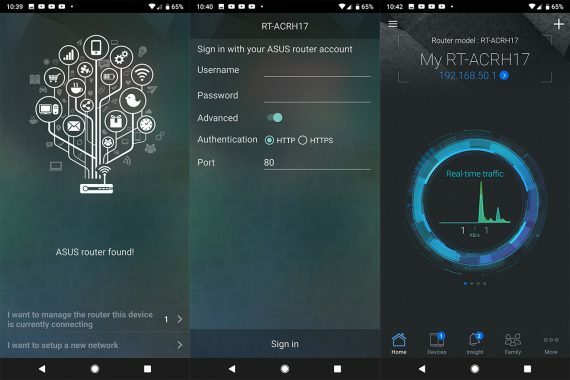 The Asus RT-ACRH17 can be configured and monitored using either the web-based interface or through the dedicated mobile app. 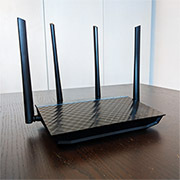 For the initial set up process, I chose to use the application (which is the same for all the Asus routers – only the features will differ): the first thing that I had to do is connect the mobile device to one of the two available WiFi networks (I used an Android smartphone) and wait until the app detected the Asus router – at this point, you will be able to select the name of the discovered routers; next, I had to sign in with the default credentials (admin/admin), change the username and password to something secure and I immediately gained access to the full UI (the router automatically detected the network connection, which, in my case, it doesn’t happen that often with other routers, so that’s a plus). The mobile user interface looks modern and the Home tab has a nice circular animation where it shows the Real-time traffic, the number of connected devices, the WiFi settings and the CPU/RAM monitor. From here, you can navigate to the connected devices (tap on any device to view detailed info, as well as gain the ability to block its access to the Internet, limit the bandwidth and view its connection quality), visit the Insight tab, configure the Family settings (block all devices or schedule access block for any connected devices) or click on More to summon all the available options. Under Features, there’s the Guest Network and the Wireless settings (felt very limited – for full configuration, you need to access the web UI), the Network Diagnostic (check for possible faults in the network), DNS Setting, FTP and Samba, Parental Controls, Security Scan (scans for possible breaches in the network – it’s powered by TrendMicro), BackUp and Firmware Update, Traffic Statistics, WiFi ECO Mode (reduces the WiFi power and data rate to save on the power bill), WiFi Block List (add devices to a block list), IP Binding and Port Forwarding. Under Plugins, there’s the AiCloud, the AiPlayer, AiCam and Asus Extender, while under Third-Party, there’s only the XiaaLive app. Switching to the web-based interface (accessible by going to the default IP address: 192.168.50.1), I was greeted by the same good ol’ dark blue and grey UI, with the main menu on the left. 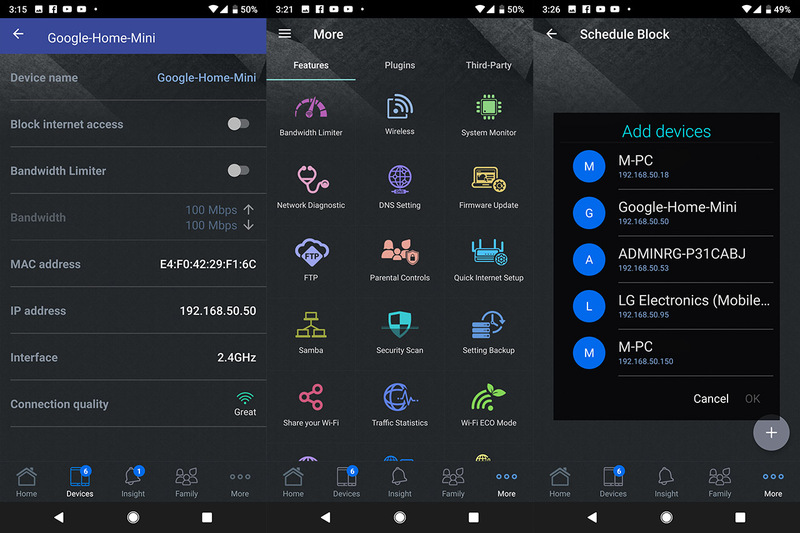 The Network Map is similar to the Home tab from the app, showing some status info about the device, the same as the Guest Network, which allows the creation of up to three guest networks on each band. The Traffic Manager displays a graph with the traffic under the Traffic Monitor and it allows you to enable QoS (either limit the band on all clients or individually), while the Parental Controls allows you to limit the access to the Internet on a maximum of 16 devices. Under the Advanced Settings, you start to notice the difference between the app and the web-based interface, since you can adjust a lot more parameters on the Wireless settings (you can change the channel bandwidth, the mode, the security and a lot more by going to the Professional section – you can also configure a Wireless Bridge system under WDS), the LAN settings (IP, DHCP server, Route and Switch Control) and WAN settings (configure the Internet Connection, enable Port Trigger, Port Forwarding, DMZ, DDNS and NAT Passthrough). 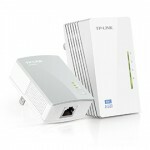 Furthermore, you can configure the IPv6 connection, enable the VPN Server (PPTP or OpenVPN), configure the Firewall (includes DoS protection, ICMP Echo Request, IPv6 Firewall, URL Filter, Keyword Filter and Network Services Filter), switch between Wireless Router and Access Point Mode, view the System Log or use the Network Tools (Ping, Traceroute and Nslookup, as well as Netstat or Wake on LAN). 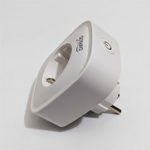 So, the ASUSWRT, as always, is enough to satisfy the needs of both beginners and tech-savvy users, but, what’s a bit disappointing is that RMerlin can’t create a third-party firmware for it (the ARCH17 is not built on the Broadcom platform) and it seems that neither the people from Project LEDE (OpenWRT) have given much thought on developing something for this router. 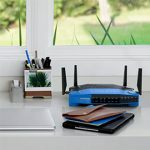 Asus hasn’t made significant changes to the design formula on its low-to-mid-range routers, but even if it didn’t follow the latest design trends, it didn’t stop the RT-ACRH17 to be an attractive inexpensive solution, especially because of its great wireless performance on the 5GHz band. Furthermore, the web-based user interface and the app offer a plethora of options suitable for both beginners and more experienced users. It’s clear that the router could have been more than it is (the hardware supports three bands) and if you’re not bothered by the lack of support from the third-party developers, then the Asus RT-ACRH17 is one of the best routers in its category (where it has purposely positioned itself so that barely any competitor can rise up to its performance).